With a fleet of luxury cars and SUVs, Cadillac has become the epitome of cool and luxury while maintaining a standard of excellence that stands head and shoulders above all other automobiles and luxury car models. Cadillac is one of the oldest models of automobile, not to mention luxury vehicles and over time has perfected combining quality design and performance with every imaginable comfort available to make driving a Cadillac a memorable experience in itself. 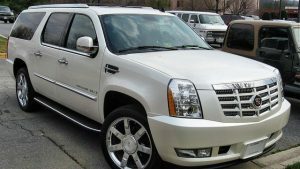 Not surprisingly, with all of the work that goes in to producing each luxury sedan or SUV, maintaining your Cadillac regularly is an extremely important part of owning one. Drivers sometimes choose to ignore the recommended service schedules but with Cadillac, improperly following the maintenance schedule can lead to issues with handling and performance that you’ll notice almost instantly. With luxury vehicles such as Cadillac, you don’t want to go to just any mechanic for services. As maintenance is such an important aspect of owning a Cadillac, finding an auto repair shop that knows what your vehicle needs no matter what the model is or issue appears to be, will help you enjoy your car and keep its’ performance in peak condition for years. A&M Auto Service is the one-stop place for all of your Cadillac’s needs. Our Cadillac specialists have decades of experiencing servicing and maintaining vehicles and when combined with our passion and knowledge of Cadillac’s through the years means that when you bring your car into our mechanics, your car will receive the service it actually needs. We work with only the highest level of factory quality tools and diagnostic equipment meaning that you wait less time while we properly find any issues in need of repair. Following your vehicle’s maintenance schedule has never been easier then when you bring it to A&R Repair. Our experience will make sure that your Cadillac gets the service it needs to ensure continued above average performance. Our specialists will also make sure that any repairs you need are done discreetly, leaving your car looking as good as new. Located in Pineville and also servicing vehicles from the Charlotte, Matthews and Balllantyne areas, A&M Auto Service will give your Cadillac the care and attention to detail it deserves.